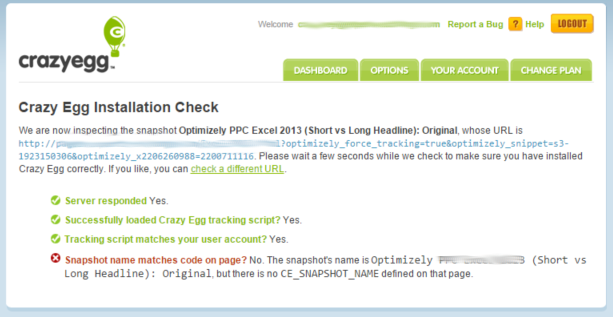 I have Optimizely integrated with CrazyEgg via the API configuration, as outlined here. The 'disable force variation' option is not-checked in the Project Code Settings. Snapshot name matches code on page? No. The snapshot's name is Optimizely <snip>...</snip> (Short vs Long Headline): Original, but there is no CE_SNAPSHOT_NAME defined on that page. Please advise why the CE_SNAPSHOT_NAME is likely not being defined on the pages. @lb Thanks for the great detail in your question. I know this is a basic question but wanted to double-check...can you confirm that the Optimizely snippet is implemented on the page that you're targeting and that you can get included in the experiment? You can check this by looking for the Optimizely snippet within "View Source" or by opening the browser console and typing "optimizely" to see if the object has been defined. Let me know if you're seeing Optimizely defined and we can go from there. Thanks!! However, I can confirm that Optimizely is tracking the two variants perfectly inside of the respective experiment. Clicks/conversions/etc are all showing data.